Gigi Lai Chi - ???? Law Chung Ha - ???? Lee Yu Yuen - ???? 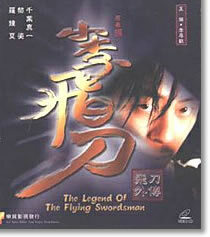 This is very loosely based on a novel of Gu Long - The Romantic Swordsman aka Little Lee's Flying Dagger because it is so different from the original story. To add further confusion, there are flashbacks all over that makes it quite confusing to understand but all would be clarified at the end. This film adaptation is quite lame actually. The reason for the main character Lei Chum Foon's (Dave Wong Kit) 10 year period of depression is so irrelevant and stupid that it almost makes you feel as depressed as Lei himself and wish that you had never laid your hands on such a film. The film's flashbacks tells us how happy the father and son relationship were when they were younger and then suddenly the guy slapped his son which drove him to become a depressant and drunkard for 10 years. Lame-azz reason. Gigi Lai plays a prostitute in a whorehouse who got pregnant by Lei and so it led to an unhappy marriage. She then gave birth and Lei's father took the baby away from her before she even got a chance to look at her baby. She eventually went all nincompoop in the head and massacred the whole family while Lei was away on a journey to deliver goods. Circumstances before and after Lei's journey allowed Gigi Lai to encounter a Korean martial artist whose background information is just all that - a Korean martial artist. He fell in love with her. Gigi Lai gave birth to another baby. Then Lei Chum Foon involves in a deadly duel with the Korean dude and who dies who lives.....you just gotta watch it to find out. On the other hand, don't bother at all please since the film is so boring and it doesn't consist of much fights. In a nutshell, the title doesn't have anything to with the movie in terms of story.